Experiences that leave a lasting impression. Immersive storytelling is at the heart of engaging an audience at a deeper level, whether that be for brand engagement, theatre performance, museum exhibitions or anything in between. It’s about leaving a lasting impression when an audience interacts with a brand or product. Understanding the big picture of what future audiences want from entertainment and experience it’s clear that an increasing exposure to real sensory experiences is up there at the top of the list. Footprint is constantly exploring projects that push experiential boundaries. Recent work has seen audience connection beyond the traditional – through glass and walls, using touchscreens, motion sensors and conductive paint – allowing an audience to begin interacting with what’s inside. 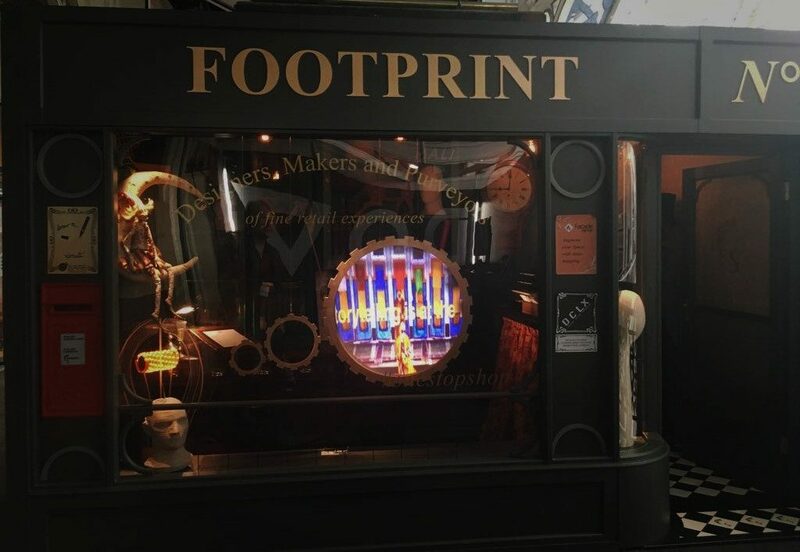 The image below shows how we used bare conductive paint to make patterns and designs on a shop window, to create interactive touch buttons which can trigger lighting, sound, AV and even smell within the shop. 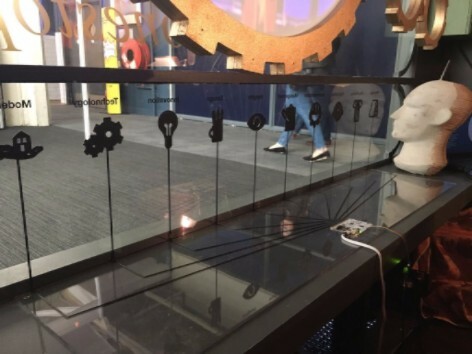 Footprint’s One Stop Shop – a fully interactive shopping experience featuring motion sensors and Bare Conductive Paint – a touch sensitive paint that can be used to trigger interactions from one side of the glass to the other. People love the sense of being in an experiential place, and this involves creating ultra-real sets and props, and total sensory stimulation. It’s a must for experiential – getting audiences closer to the product, story and brand values. Combine this with our traditional skills and attention to detail, means that we have one powerful offer, perfect for experiential audiences whether in museum exhibitions, brand activation or entertainment. 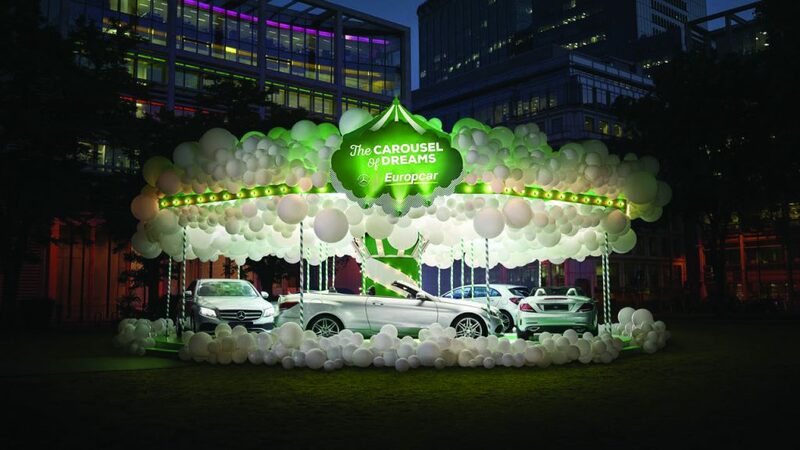 The project below for Europcar featured Footprint providing a fully working ‘car’ carousel where members of the public could interact, immerse and have fun with the experience, ‘driving’ onboard the carousel, taking photos and engaging with the brand in a memorable way. Our wider design and immersive offer is enhanced by our attention to detail and core services – producing beautiful and simple work. Our core services include CNC & laser cutting, work with wood, metal, fabric, plastic and paint. The installation below shows this combination of core services, interwoven with digital technology. 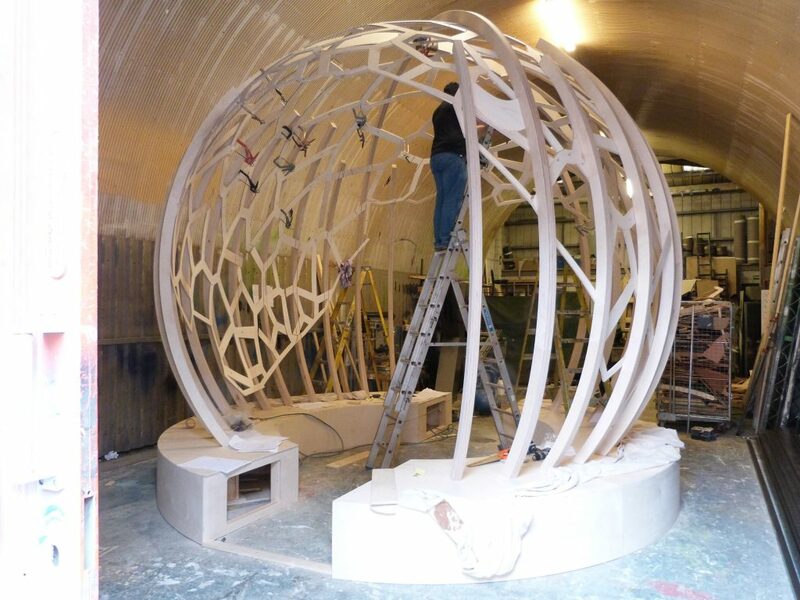 This complicated structure was produced digitally from beginning to end, first as a 3D digital drawing, which we could manipulate into the round structure, then flatten for the cut on the digital CNC cutter. Traditional craftsmanship and skill was required to assemble the structure. 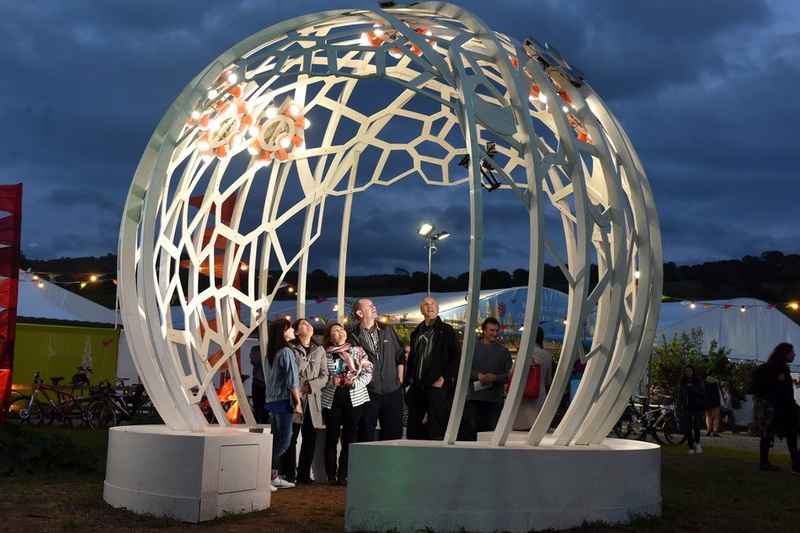 Hay Festival goers admire the ‘Night Time Sun’, an interactive art installation inspired by Jaguar Land Rovers Lighting up Lives solar project in Kenya (PRNewsfoto/Jaguar Land Rover). Jaguar Land Rover, Brooklyn Brothers, Satore Studios. Footprint offer a turnkey solution and can help deliver your project from concept through to completion. Through years of production experience we are fully versed in the languages of design and construction. We believe in partnership and collaboration, calling on the expertise of partner suppliers when required and collaborating with our client partners to offer the best value engineered solutions. We provide full build services including metal fabrication, carpentry, scenic finishing, 3D modelling, CNC and laser cutting. Our design studio includes the full Adobe suite, AutoCad, Fusion 360, Rhino and V-Ray. We also offer UX design and production and have recently partnered with George Davies of Pecelec Studios who is based at Footprint HQ. George is an experienced engineer providing digital software and hardware solutions for our client base.